Heavily armed Naxalites attacked security personnel in Sukma district in Chhattisgarh, killing 16 persons. 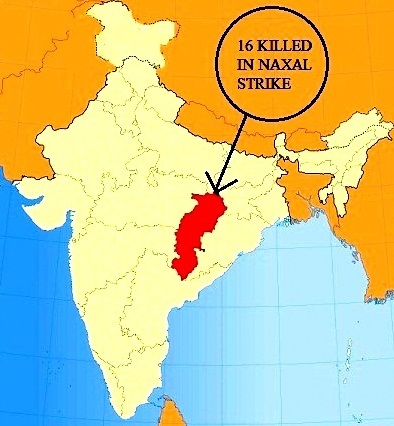 This is one of the biggest terror strike by left-wing extremists in the Central Indian state, after the last year's Darbha Valley attack in which nearly 30 persons were killed. The Naxals ambushed the security personnel including Central Reserve Police Force (CRPF) personnel and policemen, who were on way to Jagdalpur. Sukma is a district carved out of Bastar in Southern Chhattisgarh. The Red militants took away grenade launchers, assault rifles and other arms and ammunition from the policemen. Nearly 200 Naxalites surrounded the police party. The Naxals surrounded the policemen from all sides and began firing. For 2 hrs, the cross-fire continued. Landmines were also laid in the entire area and several policemen died because of these IED explosions. Those killed include a civilian. Last year, Naxalites had attacked Congress leaders in Darbha Ghati (Valley) in the same district, killing nearly 30 Congress leaders and policemen. Senior Congress leaders like former Union Minister Vidyacharan Shukla, Nand Kumar Patel, Mahendra Karma, Uday Mudaliar were killed then. After today's incident, it is clear that Maoists are again on the offensive. The state government has failed to act. Policemen are being killed in large numbers. Congress has demanded that the Chief Minister Raman Singh who heads the BJP government in the state, must resign.